Okay friends, you may or may not know, but I am a US Navy Veteran. Many of my travels as a younger man involved being assigned to a US Navy worship. When I decided not to re-enlist, I had decided I would not go on any other cruises. Well, many years later I meet my great wife, and she wanted to take a cruise. So we decided we would take a little three day cruise on Carnival. This is how we learned a few things about cruising. Our first stop on this cruise was Key West. I thought that was great, I had never been to the most southern point of the United States of america. This first stop gave me the opportunity. The weather was great, it was late April, and we were able to walk around the small port town of Key West. Ie also took a Glass Bottom Boat ride, but the seas were a little choppy, and we really did not see much on the trip. The Key West Hard Rock Cafe was open, so we caught a bicycle basket ride from the picture above to the hard rock for lunch. It was a short little visit, I think I want to go back and see more of the island. If you have a chance you should check out Key West. Key West in on my bucket list... someday!! Thanks for stopping by wittbits. You have some very inspiring pictures. Keep writing. Hi from A-Z. FYI the southernmost point in the CONTIGUOUS US is in Florida but the southernmost point period is actually in Hawaii. Shawn, Hawaii is on our travel list. 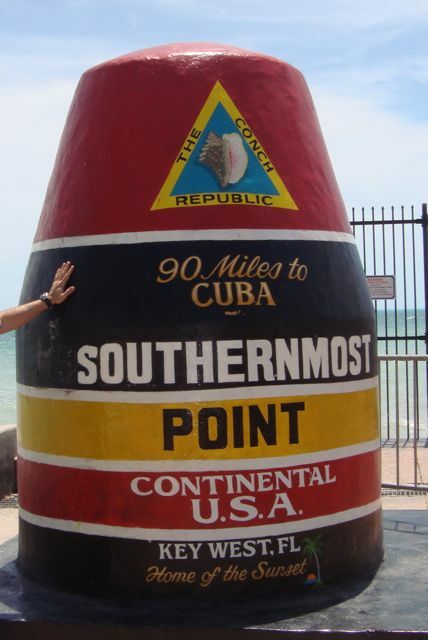 Maybe I can then stop by the southern most point in the CONTIGUOUS US. In addition, I have been to Singapore and it claim to the southern most point of Asia. I just don't recall the caveat for the claim.